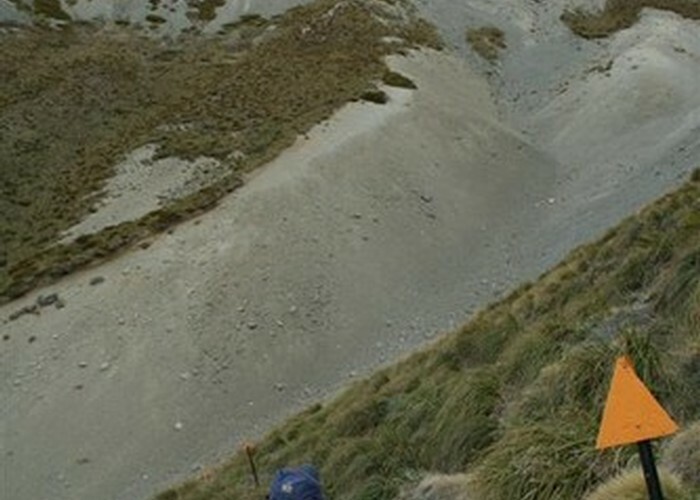 This track follows two river valleys between Mount Fyffe and the Seaward Kaikoura Ranges. Since the Nov 2016 earthquakes, times will be slower. The tracks seem to be preserved for the main part and all windfalls have been cleared as of May 2018. Kowhai Saddle • By Matthew. Mount Fyffe road end car park, Postmans Road northwest of Kaikoura township. This track explores the landscape behind Mount Fyffe, and affords good views of the Kaikoura Ranges. The Kowhai River is rather dry and scrubby, while the Hapuku is notably prettier: a raw landscape and a rich damp forest. Kowhai Hut • By Matthew. The track ends are some distance apart, so you will need end-to-end transport. If you stow a mountain bike in the bushes, it will take about one hour to cycle back to your car. From the Mount Fyffe car park, a 4WD track leads down onto the scrubby Kowhai river flats and leads up the true left. From here the route simply follows the river bed. Where the river becomes winding, passing Snowflake Stream and a small knob on the true right, a side-track up Spaniard Spur leads off on the true left (2 hours from the car park). That track takes 3 hours to climb directly to Mount Fyffe Hut. Beyond here, a mossy track leads through kanuka forest, then crosses to the true right and climbs onto a grassy terrace. Kowhai hut is located here, with ample grassy camping nearby. Kowhai Hut • Standard Hut (DOC). Capacity: 6. From the hut, the track drops into forest and crosses the river to begin following a side creek to the saddle. There are numerous small crossings from here. Eventually the track enters patches of low totara forest and sub-alpine scrub as it follows the creek. A final brief climb leads to the Kowhai Saddle (1153m) 1 hour 15 minutes from the hut. A poled side-route leads off to the right up to Gables End and on to Mount Fyffe (5 hours to the hut). The main track down the Hapuku River drops off the saddle and bends right into a wide scree gully and through a shattered rock landscape. A brief poled section bypasses a gorge, then the route returns to the river bed. Watch for the re-establishment of the track on the true left at the confluence of several creeks (50 minutes from the saddle). The track leads through easy, pretty forest and crosses to the hut on the true right (1 hour 30 minutes from the saddle). 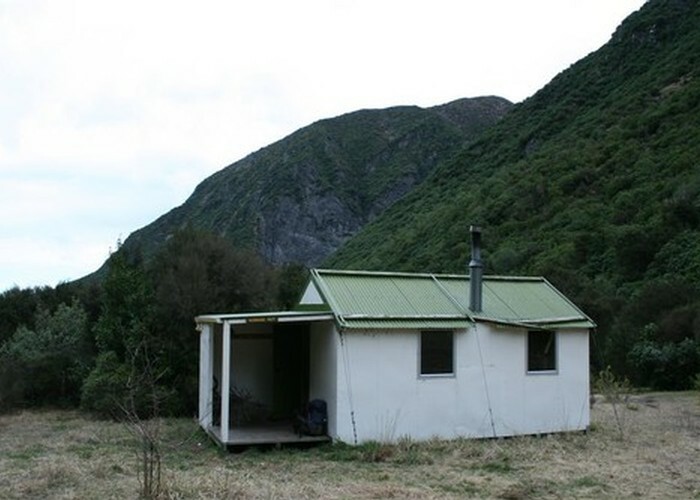 Hapuku Hut • Standard Hut (DOC). Capacity: 6. The forested track crosses the river twice before coming to a junction (30 minutes from Hapuku Hut). 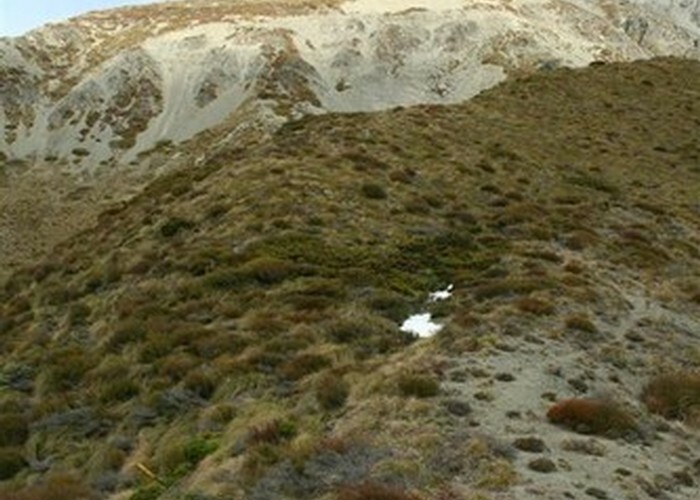 A brief side-track leads down to the Hapuku Forks and the route up to Barratt's Hut. The main track continues, avoiding a gorge by climbing onto a plateau rich with large Hall's totara, matai and rimu trees. Head of the Hapuku Valley • By Matthew. The track soon drops to the deep grey riverbed, buried in thick terraces of shingle all deposited during a storm in 1983. Past a distinctive waterfall (and sometimes aggressive falcons) the river opens out onto flats. Pick your way out over the stones, with many small crossings. A track takes up briefly on a low terrace on the true right bank for a while, but missing it won't make a lot of difference. Eventually, markers indicate the ford and car park. From the car park, a circuit along the Kowhai River, up Spaniard Spur, and down the Mount Fyffe Track takes about 5 hours. Spaniard Spur is rough and steep. A route leads over the summit of Mount Fyffe, via Gable and Gables End to Kowhai Saddle. A circuit along the Kowhai River and Mount Fyffe is about 12 hours. Added 14 September 2007 by MatthewMatthew. 4 revisions, most recently 7 May 2018 by HonoraHonora. 736 views in the past year (61 per month).